Born in Spain in 1980, lives and works in Berlin and Barcelona. 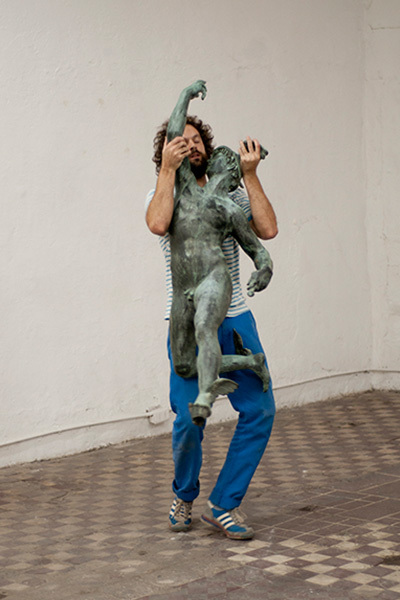 Andrés Galeano holds a Philosophy degree at the Universtiy of Barcelona, a Photography diploma at the Freie Fotoschule Stuttgart and a Sculpture/Free Art degree at the Kunsthochschule Weißensee Berlin. He works with drawing, photography, video, installation and performance and has realized exhibitions and performances in Europe, Latin America and Canada. In Berlin has been curating the performance art programme Extension Series at Grimmuseum, ¡POESÍACCIÓN! at Instituto Cervantes and co-organizing the Month of Performance Art Berlin. Andrés Galeano. Mercurio Vorador. 2014. Santiago de Chile. Photo : Gonzalo Tejeda.